Portland, Maine has always been an important port and manufacturing center, Maine’s largest city is an ideal community – in fact it is often mentioned as one of America’s most livable small cities.There is so much to see and do, including a just-completed 30 mile network of bike and walking trails, some of it along the water. There are some fine beaches in and near Portland, although the water tends to be quite cold. The retirement community housing choices are very good, ranging from private homes to condos. Some retirees live here for the summer, and then migrate to a warmer climate. Cape Elizabeth is one of the nicest suburbs. Prices are a relative bargain compared to other parts of New England. According to the National Association of Realtors, the median selling price in the fourth quarter of 2018 was $290,700, in the Portland-South Portland area. • Lively downtown with broad streets and excellent shopping • The Old Port • Livable small city • The 1873 Italianate Portland Custom House • Cathedral of the Immaculate Conception • Portland Head Light and Museum • Maine College of Art • Fabulous coast of Maine • Back Cove designed by Frederick Law Olmstead • America's "Foodiest" Small Town by Bon Appetit Magazine, numerous other "Best Places"
Portland is above average in walkability when compared to other towns. 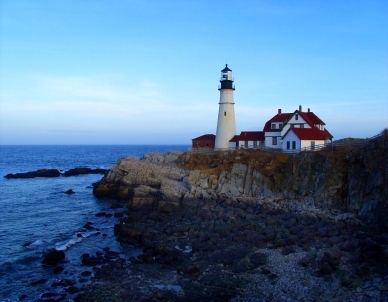 Portland is located on a peninsula beside Casco Bay on the Gulf of Maine and the Atlantic Ocean. Thanks to the moderating presence of the water, Portland winters are several degrees warmer and summers cooler than just a few miles inland. The average July high is 79 and the January average low is 12. November is the wettest month with almost 5" of precip. Portland International Jetport. 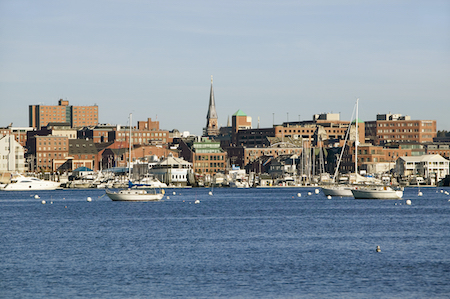 There is intercity bus service and Amtrak service to Boston, MA with several trains per day. There is a local public bus system. Portland is also a great walking city and has a high Walk Score of 65 from walkscore.com. The State Ferry Terminal has many daily ferries to Casco Bay Islands, many of which are inhabited year-round.